Emaciated, starving bears, open wounds, missing limbs – that was the shocking scene awaiting Animals Asia veterinary staff at a bear bile farm in Halong Bay, Vietnam. 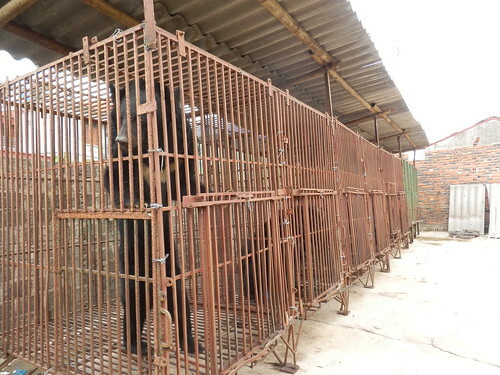 The farm has 27 bears and is one of three remaining in Halong City. The farmer, who has long profited from the bears, was forced to open his doors by local officials. The scene is in stark contrast to adjacent beauty spot Halong Bay which is visited by millions of international tourists every year. The local Forestry Protection Department (FPD) took the decision to allow access to Animals Asia's inspection team due to reports of plummeting bear numbers and bear deaths. Bear numbers on Halong Bay bear farms have dropped dramatically from 280 in 2007 to just 49. Flanked by government officials and a police guard, an Animals Asia veterinarian and a vet nurse visually inspected all 49 bears on three separate farms in the tourist hot-spot. But it was the state of the bears at Cau Trang Bear Farm, just minutes from Halong City's famous waterfront, which caused most concern with veterinary staff overwhelmed by the desperate state of the animals they found. - Nearly 20% of bears classed as "emaciated"
- Average body score was 1.1 on a five point scale signifying the bears are "severely malnourished"
- 100% of bears suffering from footpad hyperkeratosis – dry cracked and painful paws from standing on bars. In addition, having suffered potentially decades of bear bile extraction, internal damage is expected with the bears likely to require the removal of diseased and damaged gall bladders. The report on the conditions of the bears has now been lodged with government. "It was a shocking scene. 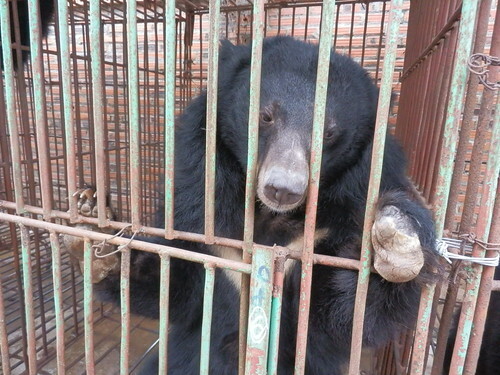 We are well used to the horrors of bear bile farming but we were shaken. The report makes it clear that the five emaciated bears are fighting for their lives." The inspection marked the first time ever that the farms, situated near Vietnam's most iconic tourist site, have been forced to open up to independent observers. Despite reports to the contrary, they are still receiving customers, though the reduction in bear numbers is a clear sign that business is plummeting. "It was a tense visit because the bear farmers didn't want us to be there but they had no choice. "This is a key point. 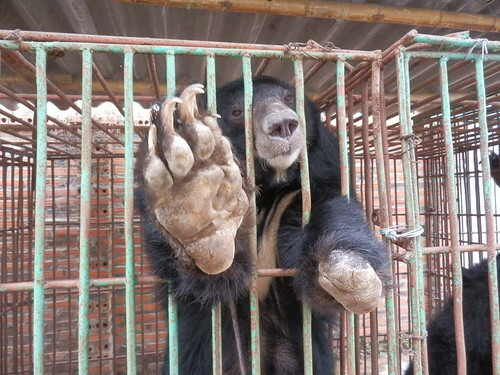 Bear bile farming is illegal so farms are only allowed to keep the bears on behalf of the government. Essentially these are government owned bears registered with farmers who provide their care. The farm conditions and the fact that bears are dying is clear proof the farmers aren't upholding their side of the deal. "Now we appeal to the government to step in. Please don't let this go on."